Spicy Hokkaido Soup - The Best Recipe! Simple and delicious Spicy Hokkaido Soup. Creamy and tasteful - Enjoy! Denmark and the Nordic countries in general have a great climate to grow pumpkins. Therefore, each fall the grocery stores in Denmark sell cheap and delicious pumpkins. I have in the recent years fallen in love with this great vegetables. 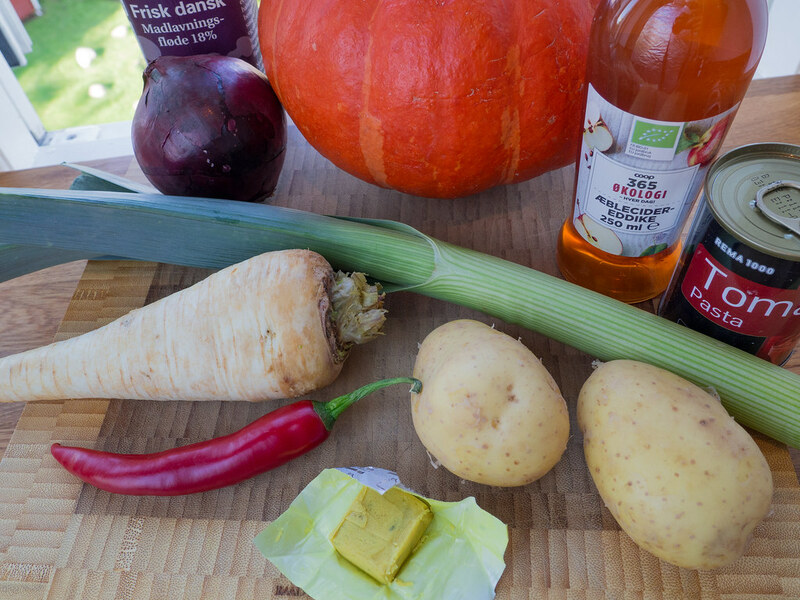 Pumpkins and especially the Hokkaido pumpkin, has not always been a standard vegetable in the Nordic countries. As the world has become ‘smaller’ and the globalization bigger, this great vegetables has become more and more loved by the Nordic people – and of course I am one of those people. 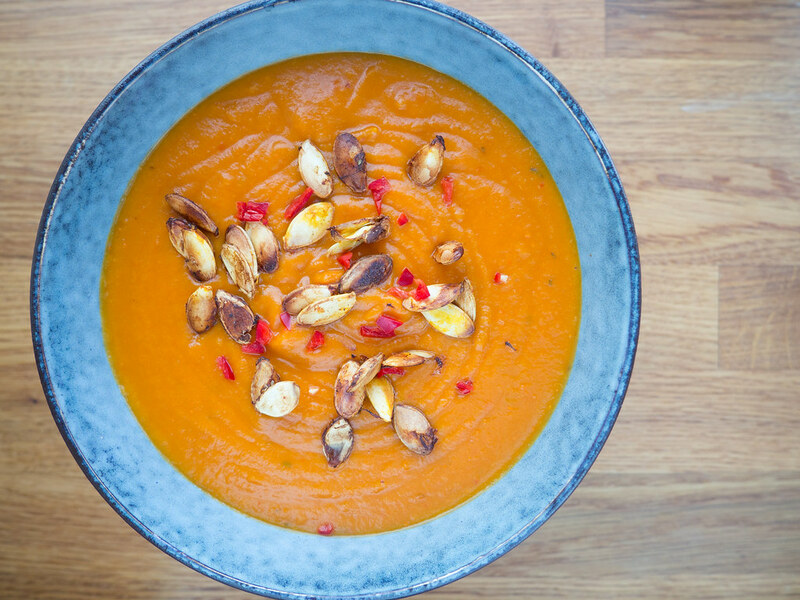 This spicy Hokkaido soup is very easy to prepare and I personally think it has a wonderful taste with the best creamy consistency – just as it should be. The Hokkaido pumpkin is originally from Japan but has found its way to Denmark. 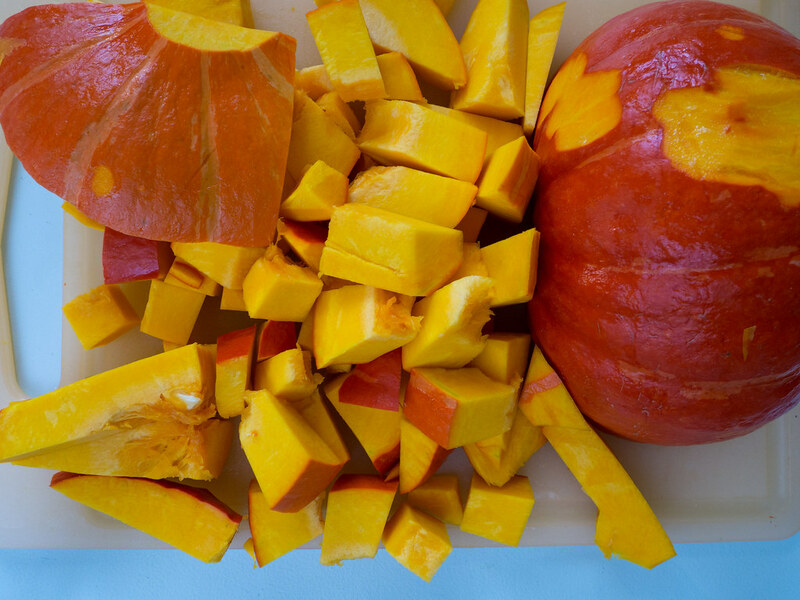 The pumpkin has a hard peel and a soft inner core, which is filled with the most delicious pumpkin meat. 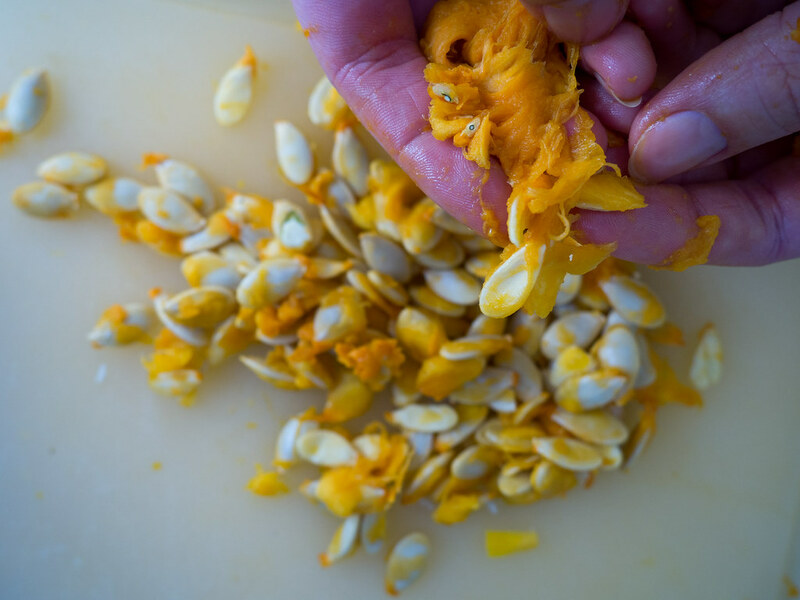 When cleaning the pumpkin you should remove the seeds but leave the peel on. 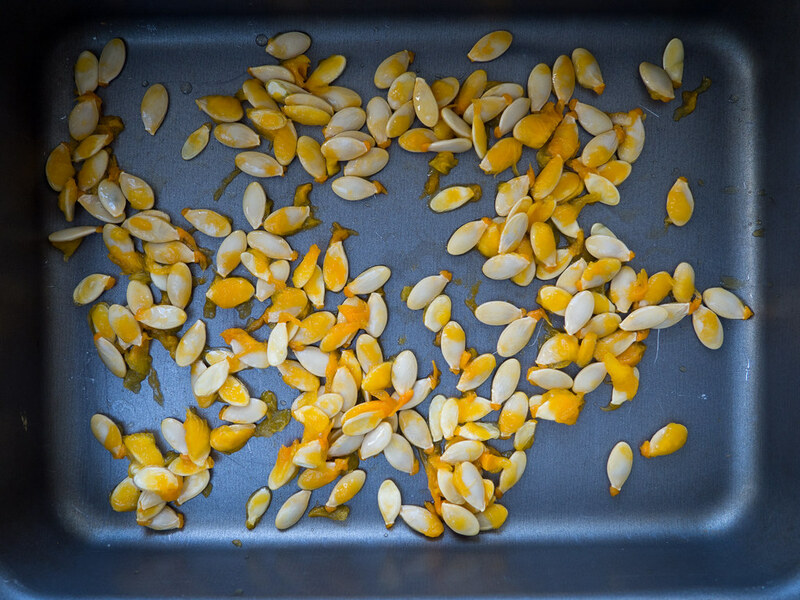 The seeds are easily removed using a spoon. Remember to save the seeds. These will make a fantastic topping once they are cleaned from the worst pumpkin meat and then baked at 200 C (400 F) for about 30 minutes. When I make this spicy Hokkaido soup I always start by dividing the pumpkin in quarters, remove the fluffy meat with the seeds and then I cut the rest into coarse pieces including the hard peel. This way the seeds can be abked in the oven while I prepare the rest of the ingredients for the soup. When you have the oven turned on, to bake the pumpkin seeds, I can also highly recommend to bake some homemade bread. I have several very easy recipes, for homemade bread, here on my blog. My personal favorite bread is the twisted bread with sunflower seeds – you can find the recipe in the bread section. The consistency of a soup is a personal matter. I typically like my soups in the thicker end where other people prefer a more fluent soup. I personally think the consistency you get by following the recipe below has the best consistency. 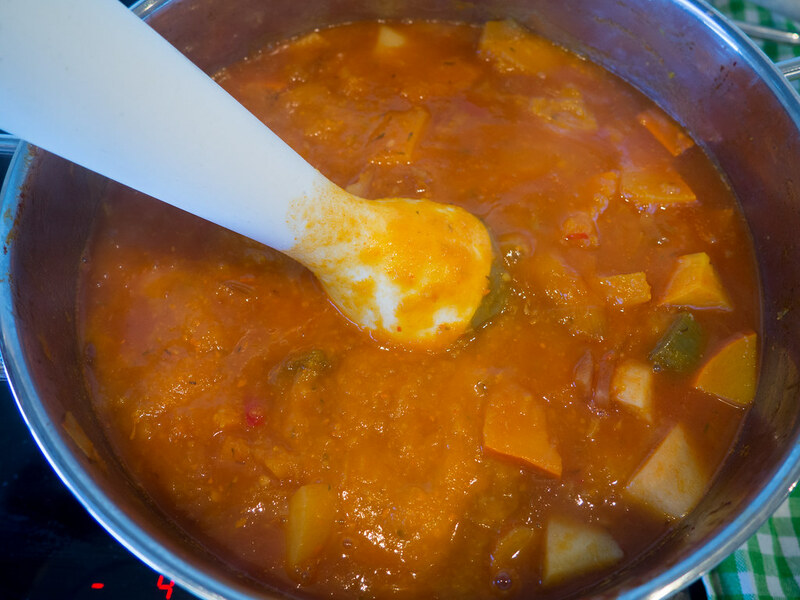 However, if you prefer it thicker or thinner you can easily add less water, let the soup simmer for longer or you can add more water in the end. It is totally up to you and your preferences. 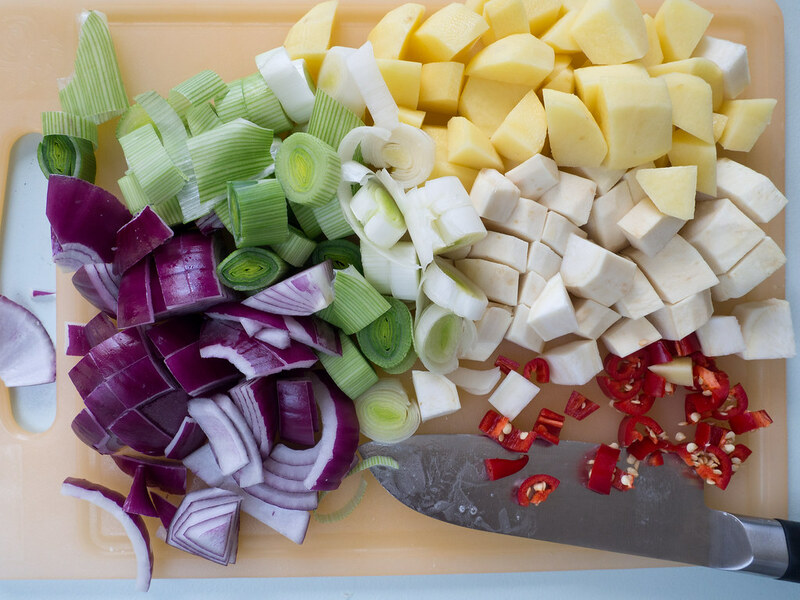 Clean all the vegetables and coarsely chopped them; the Hokkaido is divided and the seeds removed with a spoon. Coarsely cut the Hokkaido with the peel still on. Remember to save the seeds. 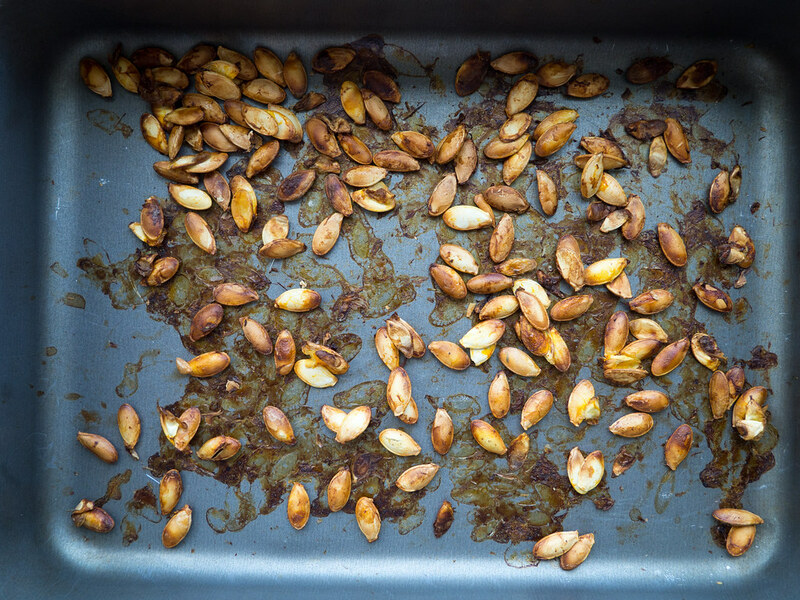 Remove the worst pumpkin meat from the seeds and bake them in the oven at 200 C (400 F) for about 20-30 minutes or until they are crisp. They are later used for topping. 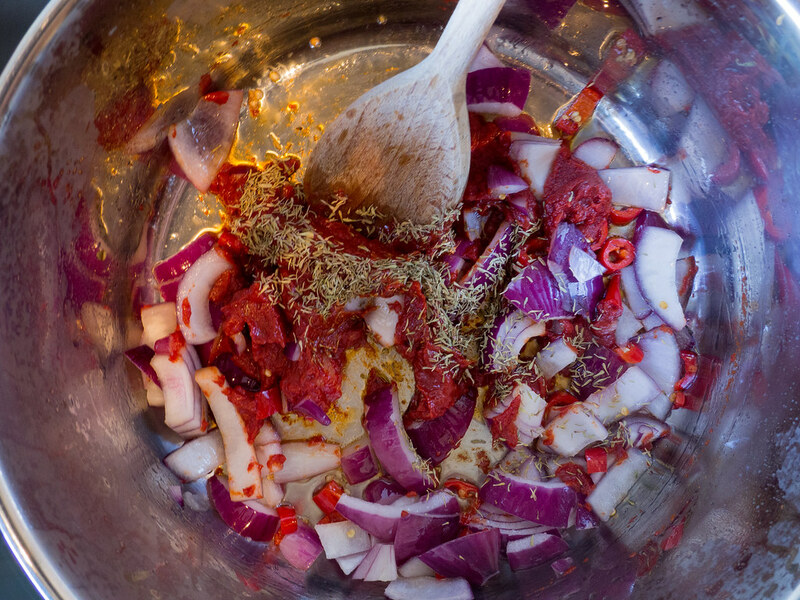 In a large saucepan; heat up some vegetable oil and fry the red chili, tomato paste and onions for a couple of minutes. Now add the rest of the ingredients except the heavy cream. 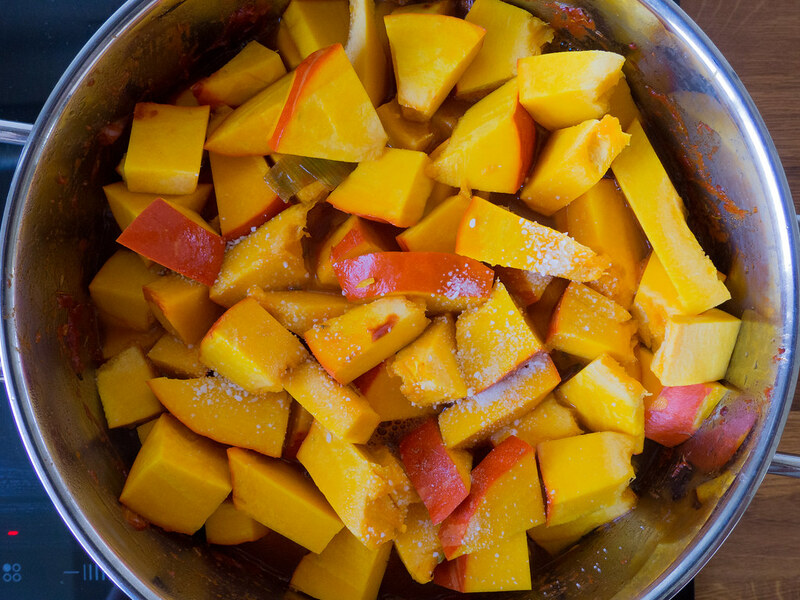 Let it all simmer/cook under medium heat until the pumpkin and potatoes and tender. This takes about 30-40 minutes. 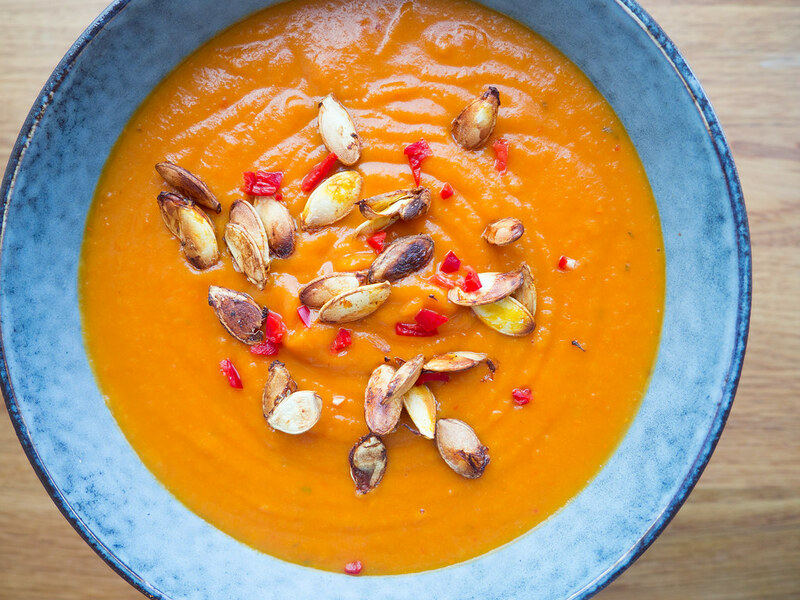 Use a hand blender to blend all the ingredients into a nice and smooth soup. Under low heat, add the heavy cream and stir in the soup. Now it is time to evaluate the consistency of the soup. If you think, it is too thin let it simmer some longer time. If you think it is too thick, add some more water. Make sure the soup has a good consistency and that it is hot. 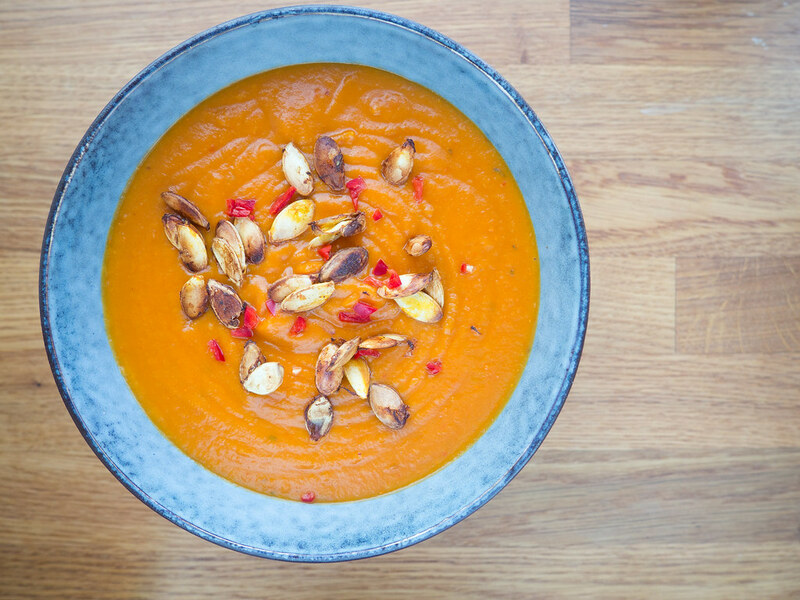 Serve it with the baked pumpkin seeds and some freshly baked bread. I tried this two weeks ago and I still remember how good it was so I am repeating today ! Thank you for sharing this recipe. I will definitely try it. I can see from the photos that you use parsnip as well as leek and potato. 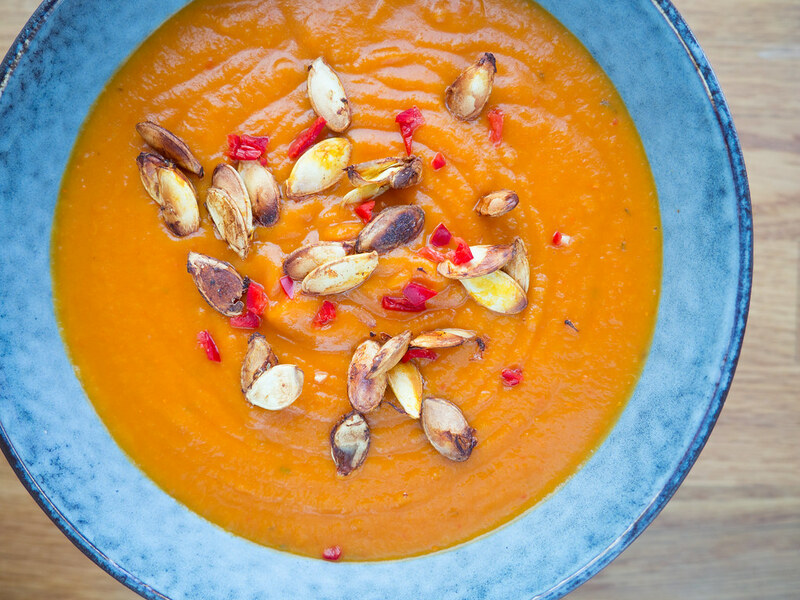 Very nice root vegetable soup, very wintery :) I have a question about the roasted seeds. You just toss them in the serving bowl to eat, skin and all? Isn’t the skin hard? Again, thank you!